I think it is very important that mankind understands this one fact; no one overpowered Jesus and killed Him, not the Romans and not the Jewish nation. Some religious people, and others who are religious about nothing, have been stating that "Jesus was a nice man. He taught many good truths. He is a great example to follow. Too bad 'they' murdered Him." For hundreds of years the Jewish people have been ostracized, hated, tormented, tortured, murdered, run out of their homes, enslaved, and most anything else demented minds can come up with because they "murdered" Jesus, a good man. For some reason, the Gentiles by Roman proxy have never taken any credit for the same thing the Jews are hated for, even though they, the Romans, were the ones who actually carried out the crucifixion. Prior to the Church there were only two classifications of people on earth; Jews and Gentiles. Since the Church came into existence at Pentecost, there are now three classifications of people on earth; Jews, Gentiles and Christians. Yet still, only the Jews are found guilty by the world court for "murdering" Jesus. Now that's really "the pot calling the kettle black." However, I return to the opening sentence, "no one overpowered Jesus and killed Him," and this is important to know. Jesus made this very clear. Jesus said three times that He alone laid down His life. He said that no one took His life. He went on to say that He has the power to lay it down and twice He said He has the power to raise it up. Now is there any possible way to be clearer than that? Of course not. No one overpowered Jesus. No one took His life. 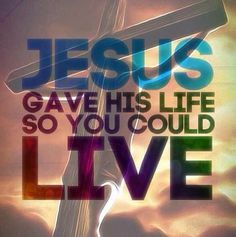 He freely gave His life for us. Maybe we should ponder on that for a moment and really let it sink in. No one but Jesus has the power and authority to be in absolute control of their life. We haven't the power or authority of preventing our death or resurrecting our own person, but Jesus does. To me this emphasizes the fact that no one took His life. He gave His life for our sake, and was raised on the third day, just as He prophesied. When reading the Gospels, we see over and over that He knew where He was headed. His gaze was fixed on a Roman cross. There were times the mobs tried to take Him, but they couldn't do so because it wasn't His time. It is most obvious that no one was able to apprehend Him if He didn't allow it. When His time did come, He allowed them to take Him. Isaiah tells us that when His time had come He didn't even open His mouth to object as He stood before His accusers. The Apostle Paul tells us that Christ died for the ungodly. He says someone just might die for a good person, but it's rare anyone would die a for righteous person. However, Jesus Christ died for us while we were still sinners. Read his words yourself. Think about this now. It's rare anyone would die for a good person, but Jesus died for us even though we were His enemies. He reconciled those to God who look upon Him and believe in Him. All of this is because He freely chose to. No one made Him. He chose to die for us in order that we would have a path, the only path by the way, to God. All who come to Him in belief are His friends. He is our God and He is our friend, not just in time of need, but all the time. No one could love us more than Jesus Christ, not even our own family. We can know that love by asking Him to come into our lives. He will never turn anyone away. You may ask, "How do I know I'm one the Father gives to Him?" The answer is obvious, if you come to Him, the Father has given you to Him, and He will not turn you away. Jesus gave His life for all sinners, and that certainly includes all of us. If you really desire to know how Jesus feels about you, just remember that He GAVE His life for you and me. No one took it. Zechariah the prophet predicted that a future day would come when the Arabs would besiege Jerusalem and the international community would intervene and become burdened by the Arab-Israeli conflict. This two-part article looks at Zechariah 12:1-6 to see if that day has arrived. Part one will deal mostly with the warnings to the world, especially as it relates to America, whereas part two will narrow the focus down to the surrounding Arab nations that share common borders with Israel. Part-two will explain how the Arab-Israeli conflict concludes prior to the seven-year Tribulational Period. Historical Setting of Zechariah’s Prophecy Zechariah’s prophecies in chapter 12:1-6, concern Israel generally, but Jerusalem and Judah more specifically. Forms the spirit of man within him. This Isaiah prophecy was issued well over a century before Jerusalem was destroyed by the Babylonians around 586 BC. Isaiah essentially stated that, as sure as the Lord single-handedly stretched out the heavens, spread abroad the earth and created mankind, the JEWS would rebuild JERUSALEM and JUDAH. Isaiah anticipated the destruction of Jerusalem by the Babylonians and the subsequent need to restore it. Isaiah 44:26 prophesied that JERUSALEM would be inhabited with JEWS and the cities of JUDAH would be rebuilt by JEWS. Isaiah 44:28 proclaimed over 150 years in advance, that King Cyrus of Persia would issue the command for the restoration of JERUSALEM and JUDAH! In 539 BC, the Persian King Cyrus conquered the Babylonians and according to Ezra 1:2, he immediately commanded the Jews to return to Israel to rebuild the Jewish Temple and restore the devastation in Judah. Zechariah’s generation was the living fulfillment of Isaiah’s prophecy. Thus, his repeat declaration of Isaiah 44:24 in Zechariah 12:1, is intended to leave no doubt that what he is about to prophesy will surely find fulfillment! Zechariah 12:1, which called to remembrance Isaiah’s prophecy about King Cyrus, clearly declared that the JEWS possessed God given sovereignty over all of JERUSALEM and JUDAH! King Cyrus commanded the JEWS, not the Arabs, to return to Israel and restore their homeland. Zechariah 12:2 foretells that someday Israel’s rightful claims to these areas would be falsely and forcibly contested by the surrounding Arab peoples. Jerusalem becomes the center of the controversy and it causes the Arabs to tremble as long as they place a stronghold over the area. The Hebrew word for “siege” is “matsor,” which can also be translated as hemming in. As this study will point out, this appears to be dealing with the current Arab-Israeli dispute over portions of these territories, namely the West Bank. During Zechariah’s time, these regions were called Judah and Samaria. Presently, the Arabs claim that these areas are under illegal Israeli occupation, but Zechariah’s claims make it clear that it is the Arabs that are trespassing into these lands. Today, these evil Arab neighbors are out of compliance with God’s compassionate Mideast peace plan. They are worshipping Allah, not Jehovah, and they are cursing the Jews and staking false claims upon Jerusalem and Judah. 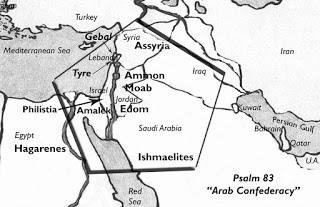 As a result, the Lord will be left no other choice than to “utterly pluck up and destroy that (evil Arab) nation.” The evil Arab nations likely represent the inner circle of nations depicted in the Psalm 83 map image. Correlating verses that seem to identify them and their participating role in Zechariah 12:2 are, the Arab confederacy of Psalm 83:6-8, the evil neighbors in Jeremiah 12:14-17, the despisers of Israel in Ezekiel 28:24-26, the plunderers, mockers and trespassers of Ezekiel 36:1-7 and elsewhere. It is interesting to note that the word “trembling” in Zechariah 12:2 is the Hebrew word “raal,” and it is only used this one time in the entire Old Testament. Some Bible versions translate it as trembling, reeling, or drunkenness. Moreover, the Hebrew word for “cup” is “saph” and it differs from another Hebrew word for cup, which is “kos.” “Kos” is used to depict God’s wrath contained in a cup for divine judgment purposes in Isaiah 51:17, 22 and Jeremiah 25:15. I point this out, because some biblical scholars believe that this mention of cup is dealing with God’s wrath or judgment, but this does not appear to be the case. Zechariah’s cup of trembling contains a concoction, which when ingested, results in a reaction of reeling and intoxication. The point Zechariah is making to the Arabs is, abandon your erroneous claims upon Judah and Jerusalem because they are causing you to behave like a violent drunkard. This verse predicts that when the status of Jerusalem is contested by the Arabs, “in that day,” the international community will intervene. Zechariah 12:1-6 uses the term “in that day” three times in (Zechariah 12:3, 4, 6). The adage, “in that day,” appears over 100 times in the Bible and it mostly refers to the correlating progression of events that occur within the same general time period. Like, a domino effect, with one event prompting the succession of a sequence of other interrelated scenarios. 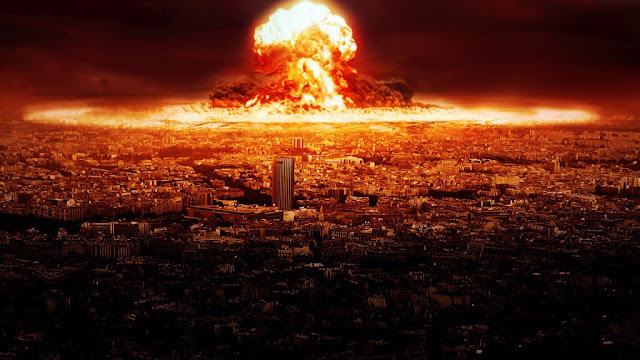 For example, in the future prophecy of Ezekiel 38 a formidable coalition of nations invades Israel and Ezekiel says that, “in that day,’ the Lord becomes furious and then proceeds to supernaturally destroy this confederacy in the events described in Ezekiel 38:14-23. Zechariah 12:3 makes a clear distinction between, “all the surrounding peoples” in verse 2, with “all nations of the earth.” In verse 3, Zechariah seems to intentionally omit the word surrounding from the prior verse. Thus, now the prophet is referring to the international community, “all the nations of the earth”. Part two of this article will further explain this difference. The word Zechariah uses for burden can also be translated as to “impose a burden.” What the prophet appears to be stating in verse 3 is; When Israel’s surrounding Arab neighbors attempt to besiege and possess Jerusalem, “in that day,” the international community will attempt to intervene and “impose a burden” upon the city. The evil Arab neighbors of Iraq, Syria, Egypt, Saudi Arabia and Lebanon were among the 13 nations that voted against the passage of the Partition Plan. Jordan was not admitted into the UN until 1955, so they aren’t listed in this elite group. Unsurprisingly, these are the primary nations that went to war with Israel in 1948. 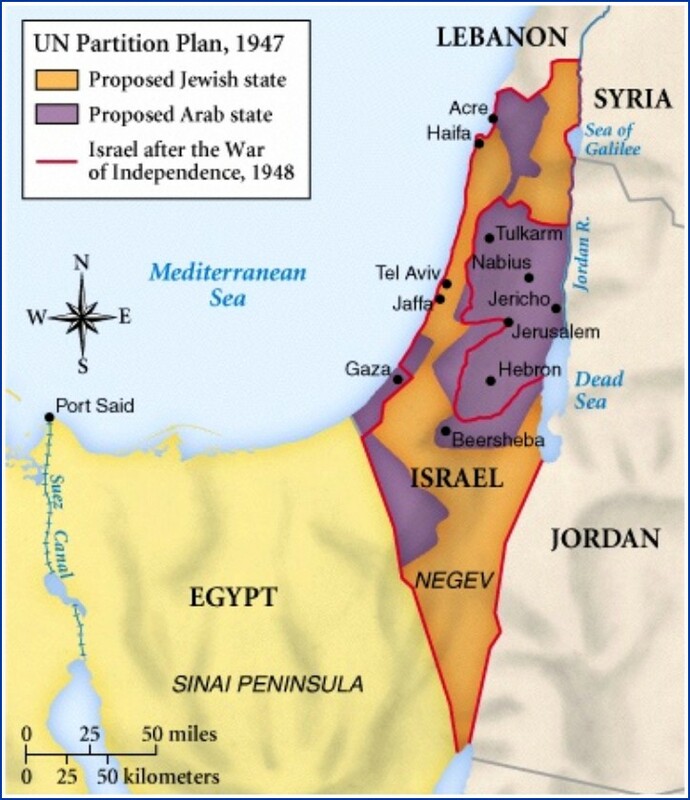 These Arabs lost that war and Israel’s Prime Minister, David Ben-Gurion, declared Jerusalem as the “Eternal Capital of Israel.” However, in the Armistice Agreements of 1949, the United Nations again imposed a burden upon Jerusalem by drawing a green line of demarcation that separated Jerusalem into two parts. Only West Jerusalem was allotted to the Jews. This 1947-1949 map image evidences that the international community intervened again on the status of Jerusalem by dividing the city. This marked the first time in history that the city of Jerusalem had been divided. The dividing of Jerusalem is not biblically endorsed. Nowhere in the Bible does it mention an East or West Jerusalem. Then, in the Six Day War of in June of 1967, Israeli Defense Forces (IDF) left the Arabs “reeling” again by defeating them in another war. 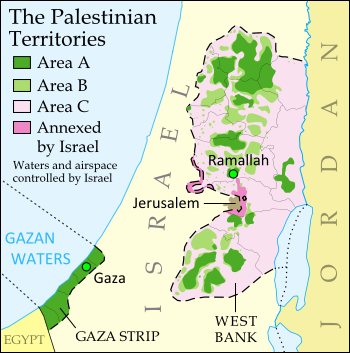 As a result, Israel gained control of East Jerusalem and the West Bank (from Jordan), the Gaza Strip (from Egypt) and the Golan Heights (from Syria). In the aftermath of their victory, Israel made the unwise choice of allowing the Waqf based in Jordan to maintain control over the Temple Mount. 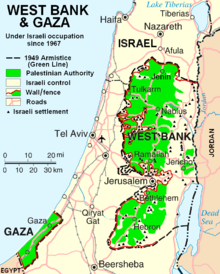 The West Bank & Gaza map depicts the current condition of the status of Jerusalem. Lo and behold, Israel presently has control over the entire city, apart from the Temple Mount. What’s observable as we look at the border changes in Israel since the Partition Plan of 1947, is that the biblical claims that Jerusalem belongs to the JEWS is prevailing over the geo-political efforts of the Arabs and the international community. The US Jerusalem Embassy Act of 1995 Over the past three decades, the US has been at the forefront of dealing with Middle East peace and the final status arrangements of Jerusalem. On his presidential campaign trail, Donald Trump promised to relocate the US Embassy from Tel Aviv to Jerusalem. However, on June 1, 2017, US President Donald Trump signed a presidential waiver that prevented the move. Relocating the US embassy to Jerusalem is not just a friendly gesture to Israel, rather it is an act of compliance with the US Jerusalem Embassy Act of 1995. On October 23, 1995, the 104th Congress passed The Jerusalem Embassy Act. It was passed for the purposes of initiating and funding the relocation of the Embassy of the United States in Israel from Tel Aviv to Jerusalem, this was to be accomplished no later than May 31, 1999. However, the move never took place because on the 6-month anniversary date, US President Bill Clinton signed a presidential waiver suspending the move. Like Clinton, Presidents George W. Bush, Barrack Obama and now Donald Trump, have all continuously signed this waiver. Some of the important points from the 17 congressional findings contained in Section 2 of the legislation are below. Finding #1: Every sovereign nation, including Israel, may designate its own capital. Finding #2: Since 1950, the city of Jerusalem has been the capital of the State of Israel. Finding #9: Congress ‘‘strongly believes that Jerusalem must remain an undivided city in which the rights of every ethnic and religious group are protected.” This is reaffirmed in finding #10. Finding #17: In 1996, the State of Israel will celebrate the 3,000th anniversary of the Jewish presence in Jerusalem since King David’s entry. (This finding acknowledges that Israel’s presence in Israel pre-dates any Arab claims to the city in modernity). 3. Pave the way for other nations to move their embassies to Jerusalem. These three things are problematic for the Arabs claims over Jerusalem. Zechariah 12:2 informed that the surrounding Arabs are intoxicated over Jerusalem. If the world’s greatest superpower moves its embassy to Jerusalem, it could create uproar within the neighboring Arab states and a firestorm throughout the greater Islamic world, which considers Jerusalem as its third holiest city. What Donald Trump and Americans need to be concerned about is the warning of Zechariah 12:3. Imposing a burden upon Jerusalem, like asking Israel to relinquish control over an area with the city of Jerusalem or territory of Judah (Judea), will have consequences. It will “break to pieces,” or “sorely wound” America. White House correspondent Bill Koenig of www.watch.org points out in his book called, “Eye to Eye, Facing the Consequences of Dividing Israel,” that dividing the land of Israel results in adverse consequences to the nation(s) directly involved. He cites the case of Hurricane Katrina in August of 2005. He correlates the evacuation of the Jews from Gaza at that time to the devastation caused during the category 5 hurricane. Former president George Bush had influenced Israel to withdraw from the Gaza and the Lord responded swiftly by slapping America with its most costly disaster in its history. The lesson to the nations is do not divide the land of Israel. If Donald Trump dares to separate the Jews from their land, especially Jerusalem as specified in Zechariah 12:3, then the warning is that America could suffer severely. If Trump plans to make America great again, he will need to make wise decisions concerning Israel and the future status of Jerusalem. He needs to tread lightly when it comes to Israel so as not to poke God in the eye. Perhaps it’s best for him to move the US embassy to Jerusalem and then just keep his nose out of God’s business concerning the final status of Jerusalem. In Part one of this two-part study, Jerusalem was explained to be a burdensome stone to the nations. Part two will address what happens to the surrounding Muslim nations in Zechariah 12:2. These Arab states falsely and forcibly contest Israel’s biblically endorsed sovereignty over Judah and Jerusalem. The 36-year-old Jared Kushner, who President Trump appointed as his lead Middle East peace envoy, has discovered what the former US Presidents, Bill Clinton, George W. Bush and Barrack Obama were forced to realize; that finding a diplomatic solution that ends the Arab-Israel conflict is virtually impossible. These former US Presidents and their appointed envoys have tried trading the biblical Promised Land for Mideast peace to no avail, and Donald Trump’s team is thus far following in the same failed footsteps. Land for peace deals are not biblically endorsed! The only diplomatic solution available to resolve the present Mideast conflict is described in the prophecy of Jeremiah 12:14-17, which was explained in part one of this two-part article. 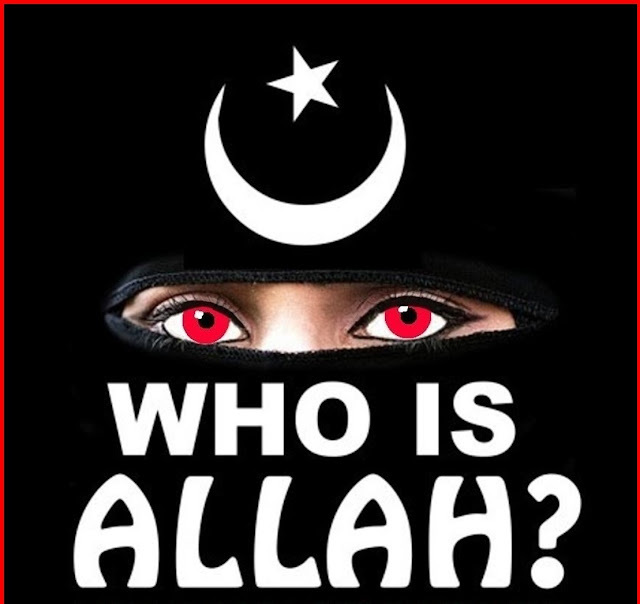 3 Jeremiah 12:16 requires Israel’s Arab Muslim neighbors to abandon their worship of Allah, the god in the Koran, in favor of worshipping Jehovah, the God of the Bible. Under the present Mideast religious environment, this will not happen! Diplomacy Will Fail and Middle East War Will Prevail. Jared Kushner’s assessment of the problematic Mideast peace process, “And there may be no solution,” is incorrect! Historically, when diplomacy fails, which it likely will in this case, wars typically prevail to resolve world and regional conflicts. This is what the Bible predicts will happen in Zechariah 12:4-6 and elsewhere. As a result of the sequence of events detailed in Zechariah 12:2, “in that day,” the prophet foretells how the Arab-Israeli conflict will conclude in the above verses. It ends very badly for the surrounding Arab nations and terrorist populations within them. The Arabs were duly warned in Zechariah 12:2 to abandon their siege upon Judah and Jerusalem. Zechariah declared that their struggle to control Jerusalem would cause them to tremble and reel like a violent drunkard. However, they persisted in their unbiblical pursuit of homesteading this holy land. It is safe to presume that these verses deal with the Arabs, because in both verses 2 and 6, Zechariah identifies the enemy as the surrounding neighbor nations. He uses the Hebrew word, “sabiyb,” to distinguish them. This is the same Hebrew word used in Ezekiel 28:24-26 and 36:3-7 to describe the neighboring Arab nations that share common borders with Israel. Zechariah 12:4-6 describes a battle strategy that can never be incorporated into any nations military manuals except for Israel’s. It involves a joint military campaign that combines supernatural intervention with conventional warfare. The Israeli Defense Forces (IDF) will unleash their superior firepower upon their Arab enemies, while they simultaneously witness their God Jehovah miraculously weaken the enemy forces. The sequence of battle events flows as follows. Please note that my interpretations modernize the military scenario. Some commentaries suggest that the world abandons modern day weaponry and regresses back to the medieval times when wars were fought with horses with riders who utilized bows and arrows. When Zechariah prophesied there were no fighter jets flown by pilots, rather, there were horses arrayed for battle with riders saddled upon them. Thus, these are the terms he used to describe this war. • First, it appears that the Lord causes the Arab artilleries, tanks and armored vehicles to malfunction. “I will strike every horse with confusion,” (Zec. 12:4a) This supernatural battle tactic was proven effective around 3500 years ago when the Pharaoh of Egypt and his armies were attempting to attack the Hebrews at the Red Sea crossing. The episode is recorded below. • Second, these malfunctions apparently create hysteria among the enemy soldiers like it did to the Egyptians in the above example. “and its rider with madness;” (Zec. 12:4b) This same result happened in Judges 7 when Gideon’s 300-man army battled against 120,000 Midianites and prevailed. -Fourth, the IDF will become emboldened to battle as they witness the enemy’s equipment malfunction and the Arab armies panic. They will gain courage as they focus on their fight to regain sole sovereignty over Jerusalem. -Sixth, in victory the Jews will end the Arab-Israeli conflict and regain sovereign control over their holy city of Jerusalem. “but Jerusalem shall be inhabited again in her own place—Jerusalem.” (Zechariah 12:6b) The Zechariah 12 and Psalm 83 Connection Zechariah 12:2, 4-6, appears to be a minor peripheral prophecy that is intended to find application to the more major prophecy described in Psalm 83. Zechariah seems to provide some of the important details that take place during the fulfillment of Psalm 83. Psalm 83, which was authored by the Hebrew prophet Asaph over five centuries before Zechariah prophesied, predicts that a war between the Arabs and the Israelis will be what resolves the Middle East conflict. Due to the striking similarities between Psalm 83 and Zechariah 12, it appears that these two powerful prophecies are interrelated. Some of these similarities are identified below. (Map superimposes the ancient names of the Psalm 83 nations over their modern-day equivalents. They represent “all the surrounding peoples on the right hand and on the left” of Zec. 12:2,6), The Arabs form an alliance against Israel - Zechariah 12:2 says the surrounding Arab states ally together to lay siege upon Judah and Jerusalem. 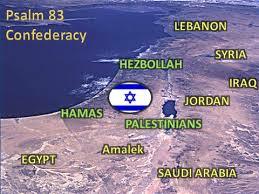 Psalm 83: 2-8, 12, predicts the same neighboring Arab states will confederate and devise crafty counsel to destroy Israel to take possession of the Promised Land. In modernity, we see that this devious Arab plan has incorporated conventional warfare, as in the cases of the wars of 1948, 1967 and 1971, and It has also included a propaganda war that has propagated the myth that the Palestinians have just claims to these Israeli territories. This hype has successfully gotten the International community to refer to these lands as “Israeli occupied” territories. The Arabs are soundly and supernaturally defeated – Zechariah 12:4-6 declares that the IDF are supernaturally empowered to slaughter the surrounding Arab armies. Psalm 83:9-11 petitions the Lord to do this very thing. These Psalm 83 verses recount the historical battles that were fought in Judges 4-8. One of these battles was the underdog victory of Gideon’s 300-man army over the 120,000 strong Midianite army. Like the Lord intervened and empowered the IDF to victory in that historic Gideon battle, Zechariah 12:4-6 will be somewhat of a repeat performance. Asaph petitioned for this in Psalm 83:9-11 and the Lord honors this specific request according to Zechariah 12:4-6. This two-part article has taken a different approach to interpreting Zechariah 12:1-6. The traditional teaching has mostly associated these verses with events that take place during the 9 campaign of Armageddon. If that’s the best interpretation, then what we see taking place in the Middle East is simply setting the stage for events that happen near the end of the seven-year Tribulation Period. However, if my view of these verses is correct, then the world is about to witness the Lord’s supernatural intercession, rather than America’s diplomatic intervention, to resolve the Arab-Israeli conflict. I believe that Zechariah 12:1-6 and Psalm 83 are Now Prophecies, which are prophecies that lack preconditions and could happen presently. My view is supported by the premise that the IDF is involved in defeat of the surrounding Arab nations in both prophecies. The IDF currently appears to be prepared to tackle this monumental task. 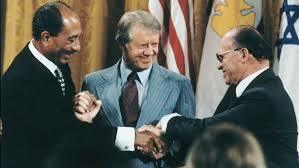 Thus, it appears that soon land for peace diplomacy fails and war prevails to resolve the Arab-Israeli conflict. Moreover, this Mideast conflict will likely conclude prior to the seven-year Tribulation Period for the following two reasons. 1. During the first three and one-half years of the Tribulation Period, Israel is living in a pseudo peace, which results from the ratification of the covenant in Daniel 9:27. This implies that the IDF will be mostly inactive and not warring against the surrounding Arab states. 2. In the second three and one-half years of the Tribulation Period, the Israelis are being persecuted in the genocidal attempt of the Antichrist. This infers that the IDF will be fleeing from the Antichrist, rather than fighting against their Arab neighbors. The next big event on God's calendar is the Rapture, and then the seven-year Tribulation followed by the one-thousand-year Millennium when Jesus will rule the earth as King of kings and Lord of lords. God has dealt with man via six different dispensations (so far), and in each one, man fails. Over and over it is proven that the natural man cannot please God. The seventh and last dispensation is the Millennium, and once again, man will fail to live in a manner pleasing to God. Only in eternity, will mankind (those who have inherited eternal life through Jesus Christ) and the angels never again have the desire or ability to disobey God. The Age of Innocence - Man is created without ever knowing sin, but then falls to its temptation in rebellion against God. The Age of Conscience - Man lives by his own conscience of right and wrong, and fails miserably in his rebellion against God. The Age of Human Government - As mankind forms into groups and human governments are formed, man quickly reverts back into sin, continuing to rebel against God. The Age of Promise - Even though God always keeps His promises, man cannot, and does not have the patience to wait on God. His rebellion against God continues. The Age of the Law - Even with clear and strict guidelines, man corrupts the Law of God by disobedience in rebellion. The Age of Grace - Even in the most coveted dispensation prior to the Kingdom age, man as a whole refuses the riches of God's grace. The grace of the cross is spurned for the works of man. The Age of the Kingdom - The Kingdom age will originally be comprised of all those who know God as Savior and Lord through Jesus Christ. All will be without sin and the ability to sin because of the saving grace of God. What could go wrong? Will mankind still rebel against God? We all know that when the Tribulation ends Satan will be bound for a thousand years (Revelation 20:1-3). So throughout the Millennium, Satan and none of his followers will be around to seduce mankind. Jesus will reign from Jerusalem. The Church will reign with Him, and the surviving saints from the Tribulation will repopulate the earth. So, at the beginning of the Millennium everyone will be a child of God. The earth will be restored. Nature will be at peace. Prosperity will abound. The life expectancy will be extended to a thousand years. Everything will be perfect. Have you ever considered just how long a thousand years is? A lot can happen in a thousand years. Think about this. As of this year, America is 241 years old. That's not even a quarter of 1,000 years. If you go on back to when Columbus headed our way, it's still only 525 years. I was born when Harry S. Truman was President. Since then we have had twelve more Presidents. I can assure you, a LOT has happened over that short period. Many, many things have drastically changed over that very short period of time. Remember, when the Millennium begins everyone is saved at that point. Everyone belongs to the Lord and He rules the earth. But ... the Tribulation saints who were not murdered will enter the Millennium and bare children. Those children, and all those born after them will have the ability to sin because they will be born with that sin nature we all have today. A population explosion will inhabit the millennial period. Billions will be born from those original Tribulation saints that will have the same choice mankind has today; honor God or rebel. When the Millennium ends Satan will be released and lead billions against Jesus and His rule (Revelation 20:7-8). How did it ever get to the point that Satan could find that many followers in a world that is perfect? Even though Satan is bound and cannot deceive anyone during that time, those billions born in the Millennium will have the ability to follow Jesus or reject Him. They will all be born with the same nature that is currently within us. It is my opinion that even though the Kingdom age (the Millennium) will have so many blessings, rebellion will begin to rise in the hearts of those born into the Millennium. The Scripture says in Revelation 12:5, "And she bore a son, a male, who is going to rule all nations with a rod of iron. And her child was caught up to God and to His throne." This male son is none other than Jesus Christ, and He will rule during that time, "with a rod of iron." There will not be an outward uprising until the end of the Kingdom age (the Millennium), but rebellion will rise and continue to rise in the hearts of many. By the time Satan is once again unleashed, they will be revealed for what they really are. If you'll think about it, God has allowed all of us to have freedom of choice, even the angels. Satan made his choice. The angels that followed him made their choice, and one third of the angels followed Satan. Adam and Eve made their choice, and every individual throughout each dispensation has made or will make a choice either to obey God or not to obey Him. Since sin entered the world through our original parents, Adam and Eve, mankind has been in rebellion. Some have decided to call upon God, but most do not. God clearly demonstrates that no matter how He deals with us, as long as we have a sinful nature, there will be those who will always rebel against Him. Today's society practically wears out the phrase, "God is love." Yes He is, and He is no less "just" than He is "love." We tend to forget that God cannot deny His justice any more than He can deny His love. We want His love in letting us "do our own thing," but not His justice in judging the sin(s) we wallow in. He has proven through six dispensations that we cannot save ourselves, and the seventh and last dispensation will corroborate the others. Only He can save us, and He can only do so through our belief in His Son, Jesus. Mankind began in a perfect world (Garden of Eden) and we failed. Mankind will close out the ages in a perfect world (Millennium) and we will fail again. Sin and its consequences must be judged and totally eradicated, and the world must be filled with the righteousness of God before there can ever be peace between mankind and his Creator God. This can only be accomplished by the grace of God in the sacrifice of His only begotten Son, Jesus Christ. All those who come to God through the Son will be saved (rescued) from judgment and adopted into the family of a Holy God. Only those who come through Jesus will live with Him for eternity in absolute righteousness, never knowing sin again. All those in Christ know God not just as our Creator, but also as our Father, because our faith rests in the saving work of Jesus Christ. In each age, man attempts to produce the perfect world, as he sees utopia in his own mind. Thankfully, God has seen fit to save us from our own delusions. The Law (or law) cannot save. Grace (if rejected) cannot save. A perfect world cannot save. Each dispensation proves that no one can be saved apart from the cross. The cross is offered each time, but only the few choose wisely. Most try an alternate route, but only those who come via the cross go into eternity as children of the eternal God to reign with Him forevermore. All those who reject the cross will spend eternity in the lake of fire and brimstone. SUMMER RAPTURE FEVER? THREE EARTH SHATTERING SIGNS THE TIME MAY BE NEAR!! The Jewish Feast Rosh Hashanah (AKA The Feast of Trumpets) is September 20/21, 2017. We wrote an article a few years back defending Rosh Hashanah as the most likely time of the year the Rapture would happen(1), regardless of the year. So each summer it's always interesting to see how the prophetic signs are shaping up...could this be the year of our exhilarating departure? Don't waste your money trying to understand HIDDEN signs few people know about. If this were truly a sign from God, it's doubtful He would hide it in a constellation from 99.99999% of the world. No, God does things like parting the Red Sea or raising Lazarus from the dead, for ALL to see and ponder. Before we go any further, the logical question we should ask is, "Can we know ahead of time when the Rapture will take place?" The answer is "not exactly." That verse tells us that the coming of the Lord at Rapture will come without warning only for non-Believers. But Believers are encouraged to be alert to the OBVIOUS signs because we have the discerning light of God's Holy Spirit. Therefore, it's incumbent on Believers to be alert to OBVIOUS prophetic signs that the current Church Age dispensation, the Biblical time period in which we live, is coming to a booming close. So how's everything stacking up this year? It's an exciting time to be alive as we're living in the generation that saw God, as prophesied, begin bringing the Jews back to their homeland. So our ﬁrst gauge is to look at Israel. We've written many articles about their God ordained return to their homeland. The main reason to watch Israel is that soon after the Rapture, the Jews will again be in the prime-time of God's earthy dealings-God will come out of His Self-imposed slumber and the entire world will know it. The heaven and earth will be shaken to its core as He lets the world know that He is the Creator God and Israel is His chosen nation. The stated purpose for the invasion is to capture riches in the land of Israel-which begs the question, "What spoil? What riches?" When Israel became a nation in 1948 she had no known natural riches for which a hostile sovereign nation would invade. In fact, Golda Meir, Israel's Prime Minister in 1969-1974, often quipped that Moses wandered the desert for 40 years and unfortunately settled in the only place that didn't have oil. It's possible Israel's government has put out the word to their media not to publicize these oil and discoveries so as not to give the surrounding Arab nations another reason to come after them. But the oil discovery within Israel's borders was described as huge. BTW-All that Middle Eastern Oil is another proof that the Bible is 100% accurate. The massive amounts of oil in the Middle East is obviously due to Noah's ﬂood burying the lush and plentiful plants in-and-around the Garden of Eden. These buried plants naturally turned to oil (11) and today Saudi Arabia, Qatar, Iraq, etc., and now Israel, beneﬁt from the destruction of Noah's worldwide ﬂood. So, because of Israel's relatively close proximity to the original Garden of Eden, it's not surprising that Israel also has massive oil reserves under its land. The question is simply "how much?" The Israeli oil and gas discoveries mean the prophecy of Israel being so dog-gone wealthy in the latter days is being fulﬁlled right under our noses. (7) And when the Rapture takes place, and the Holy Spirit Restrainer is removed from the earth, Russia will obviously "devise an evil plan" and invade Israel. On August 21, 2017, there will be a solar eclipse on the earth. This full eclipse of the sun's light will only be seen in the United States, cutting a path from the Northwest to the Southeast. This is the ﬁrst time in the history of the United States that a total eclipse will touch only the United States. But what makes this eclipse raise even more eyebrows is that another eclipse will do the same thing-exactly seven years from now, again seen ONLY IN THE UNITED STATES. Seven years-how interesting! We already know the United States is the prophesied nation in the Bible that is destroyed in an hour(6). Does this big "X" mean God is trying to "give us a sign"? Maybe. Scientists have recently been studying the link between the sun, moon and earthquakes. (10) So it's most interesting that the eclipse will cross through the two main earthquake zones in America: Cascadia Subduction Fault Zone in the Coastal Northwest and the New Madrid Fault Zone in the heart of the Midwest. The eclipse also cuts across volcanoes in the northwest like the recently active Mt. St. Helens and the unbelievably large, but long-time dormant, caldera in Yellowstone National Park. The Lord may have used the numerous volcanoes around the world as water portals for the ﬂood of Noah. (16) So hope those things stay put for now! For all my Christian life I've wondered why the Jewish Calendar was so far off. The Jews, always trying to keep the letter of the Law, are so precise in everything Biblical that they do. But the Jewish calendar says we're in the year 5777. And common sense says that's off by some 200+ years. James Ussher, an Irish bishop, wrote an incredible book on biblical chronology in the early 1650s. Using Biblical lineage, he sets the date from the Garden of Eden to Jesus' birth to be 4004 BC. So by simply adding 2017 since Jesus' birth to the 4004 years before Jesus' birth, it totals to 6021 years from Adam to today. 6021 is an interesting number because Jesus died in 30AD. And if you add seven years for the Tribulation, we're within a couple of years of completing two thousand years of the Church Age. But the Jewish calendar shows we're in year 5777. So, being that far off I never paid much attention to it. Until now! It turns out, according to an interview I watched of Michael Norten at a Texas prophecy conference last week, that in 160 AD a Jewish rabbi named Yose Ben Halafta ﬁrst created the Jewish calendar. But he strangely subtracted some 200+ years from his total years counting from Adam. Purportedly, the reason for the change was that Ben Halafta realized that dating the calendar using a literal method would point to Jesus being the Messiah. He apparently saw that the prophecy in Daniel 9-483 years from the beginning of rebuilding Jerusalem's walls to the coming Messiah, would point directly to Jesus as the Messiah. Oh dear, can't have that! So the theory is that Ben Halafta subtracted some 200+ years from the Jewish calendar so the Daniel 9 prophecy would not point to Jesus' Triumphal entry into Jerusalem. Why is 6,000 years so interesting? I've taught for over 30 years that God's creation week of six 24-hour days and nights and one 24-hour day and night of rest is His divine template of earthly time. (13) In other words, when the Lord created time, He created 7000 total years from beginning to end. Not to mention that there are two verses where God pointedly refers to one day being "like" a 1000 years. Therefore, the ﬁrst four days of creation would be a template the ﬁrst 4000 years of human history. No life was created in the ﬁrst four 24-hour days. Then, after 4000 years of recorded history, Jesus came to earth and brought "life," in day ﬁve of the template. Therefore, on the 5th day of the divine template (Five is God's number for grace) Jesus arrived bringing "life." This remarkable unfulﬁlled prophecy states that Israel would be wounded and torn for two days, but that God will raise them up on the third day and they will live in His presence. No one seems to be able to explain this verse. Well, that's what happened. We know for a fact that Israel rejected her Messiah and for almost exactly 2000 years, Israel has been scattered around the world, torn and bruised. Israel is waiting for the "third day" where they will live in His presence. There are also other verses that ﬁt this 7000-year template theory. For instance, when Jesus was on the earth, the only time period recorded in the Bible that He went to the non-Jews, the Samaritans, was speciﬁcally for "two days." Applying this to our 7000year divine template, the "two days" would be the 2000 years of Jesus going to the Gentiles. And after that 2000 years, He would return to the Jews for "one day," or 1000 years, which is, of course, the Millennial reign of Christ with Jesus living and reigning from Jerusalem. "Today and tomorrow" are days 5 and 6 of our template- the Church Age, where we are "washed" or cleansed by the blood of Jesus. The "third day" is, of course, the 1000-year Millennium where the Jews will live with Jesus on the throne in Jerusalem-"in the sight of all." So we believe God laid out 4000 years of time before Jesus came and brought life for 2000 years, 6000 total. We still have remaining 1000 years of rest, which is Jesus' reign as King of the Earth. As for the timing of the Rapture being this year-we may not know the day nor the hour, but it sure is fun watching for the season! It WILL happen one day in the future!. THE NEW JERUSALEM...THE CITY OF GOD.